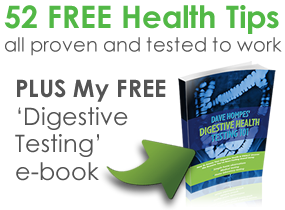 Fay, in her sixties, contacted me in April 2016 because her digestive system was feeling very uncomfortable. In fact, she had experienced digestive problems for many years. However within a few short weeks, she had resolved these longstanding symptoms and now had a super-smooth, pain-free digestive system. Fay’s medical history included low thyroid function, for which she was taking medication, and hormone replacement therapy. This is important because low thyroid is a reason for constipation in some people. A food journal assessment revealed that Fay was eating some of the foods that can irritate the GI tract, including gluten and cow’s milk. She was also quite stressed as she was cramming in family life with work and study. I recommended Fay should do a functional blood chemistry analysis, where we would look at her blood results with a little more detail than a doctor typically would. It revealed some liver stress and highlighted her underactive thyroid. However we went a step further in assessing the thyroid situation by testing for thyroid antibodies. Her TPO antibodies were elevated, showing that her thyroid disorder was actually being caused by immune imbalances. To properly deal with this and restore thyroid function we would need to work on balancing her immune system. 70% of the immune system is housed in the digestive tract, and the GI tract is heavily associated with autoimmune thyroid disease. So I recommended Fay should do some digestive screening to see whether there might be clues connecting her digestion, immune imbalances and thyroid disorder. We ran a DNA-based stool test to see whether Fay had picked up any ‘bad bugs’ that might be contributing to her symptoms. I was sure the test would pick something up, and I was right. However I was surprised at the number of imbalances detected. You can see a summary of the results below. First, you can see that H. pylori is detected. Not only that, but a nasty strain called CagA (this strain is associated with more intense symptoms in the GI tract, ulcers and also symptoms in the rest of the body (including autoimmune symptoms). Next, you can see that Fay had two parasites: B. hominis and D. fragilis. These are microscopic critters that can cause virtually any digestive symptom. You can also see a Geotrichum overgrowth. Geotrichum is a fungal organism that can overgrow opportunistically in a weakened digestive system. Like its better known cousin Candida, Geotrichum can contribute to GI symptoms and general feelings of fatigue, lethargy and so on. Anti-gliadin sIgA is a marker for gluten sensitivity. It does not diagnose celiac disease, but it shows that a person’s immune system is mounting a response to the gliadin component in gluten-containing foods. The anti-gliadin response involves inflammation, which can lead to digestive symptoms. Importantly, gluten sensitivity is known to trigger autoimmune thyroid disease in some people and we already knew this was happening with Fay. Elastase I is digestive enzyme produced in the pancreas. When elastase is low it means the pancreas is not functioning optimally and this will prevent proper digestion and nutrient absorption. I felt that we had almost certainly found the reasons for Fay’s digestive symptoms. The gluten and H. pylori findings were most important, followed by the parasites and fungal overgrowth. We had to focus for 2-3 months on removing the bad bugs (H. pylori being the most important), restoring digestion and reducing digestive inflammation. I coached Fay on how to follow a gluten-free diet, whilst also avoiding cow’s milk and other pro-inflammatory foods. The gluten—free diet would not only be important for Fay’s digestive health, but also for her long-term thyroid health, energy, mood and sleep (and everything else that goes with thyroid disorders). Then, we took steps to remove the bad bugs detected in Fay’s stool test. First, a proven 30-day stomach cleanse to fight H. pylori, then an equally well-proven 30-day general parasite and fungal cleanse to reduce the bad bug population of Fay’s intestine. Throughout these protocols, we also supported Fay’s digestive process using digestive enzyme supplementation and apple cider vinegar. We also used a homemade baking soda mouthwash to bring down the population of ‘bad’ microbes in Fay’s mouth. Finally, because Fay’s blood test revealed liver stress, we used some B-vitamins, milk thistle and bitters (a liver tonic) to support her liver and detoxification pathways. Fay did a really good job of following her nutrition recommendations and supplement protocols. During the initial 60-day program, she experienced complete remission of her digestive symptoms. The only time she experienced discomfort was when she ate foods she knew she needed to avoid. She is now in complete control of her digestion and knows precisely what triggers discomfort. This has had a positive effect on her confidence and stress levels and we are now working on adrenal, thyroid and female hormone balance to help Fay get a better night’s sleep. At the start of last year, Fay’s digestive system was giving her a lot of trouble. She made a commitment in March-April time to change that and she was rewarded by taking action. Not only did she overcome her digestive complaints, but she also gained some light at the end of the tunnel regarding her thyroid disorder. This year, are you going to keep putting up with feeling mediocre and being told by your doctor that nothing can be done to help you feel better? Or like Fay would you like to regain control over your diet, digestion and general level of vitality using some basic lifestyle principles combined with cutting edge lab testing? The combination of stool testing with personalized nutrition is very powerful and can quickly help you get over longstanding health hurdles. Stool testing helps you find the root cause so you can quickly take the action steps that are relevant to you as a unique person. No more confusion from endless conflicting info on the Internet and no more guessing. Click here to learn more about our detailed case review, stool test and consultation service, and how it can help you quickly rejuvenate your well being. It’s a risk-free service: if we don’t uncover the reasons you’re not feeling well, we’ll refund every penny.